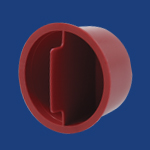 Center Pull Tapered Plastic Plugs have a center pull tab designed to facilitate removal. An extra strong tab is molded into the bottom and sides of this plastic plug and extends well above the plug flange making it easy to grasp and remove. Sold in packs of about 100 pieces.Sold by weight. NOT INTENDED FOR USE IN HIGH TEMPERATURE APPLICATIONS.